The new Solutions Review for Data Management and Data Warehouse website brings together all the latest news, product information and best practices for IT professionals interested in Data Management Platforms (DMP), Data Warehousing, Data Governance, Master Data Management, Data Analytics, the Data Lake and many other Big Data topics. The sheer volume and velocity of data that has been made available to modern digital businesses is just too great for legacy solutions to handle. Solutions Review, the leading online resource for Enterprise Information Technology news and best practices, announces today the release of the Data Management and Data Warehouse news website and the 2016 Data Management and Data Warehouse Solutions Buyer’s Guide. Developed by Timothy King, Solutions Review’s Big Data and Analytics Editor, the guide is a compilation of the top-28 solution providers offering Data Management solutions for Big Data and Data Analytics. 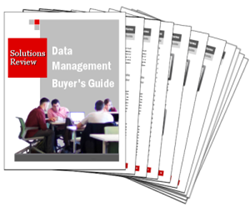 Solution Review’s latest buyer’s resource provides a comprehensive overview of the Data Management market, including full one-page provider profiles which outline each tool in detail, illustrating vendor objectives in a snapshot. Coupled with this expansive industry overview, the resource also includes the 10 key considerations buyers must take into account before making a product decision. The top-28 Data Management and Data Warehouse solution providers detailed in the report includes: 1010data, Actifio, Adobe, Cloudera, Cxense, EnterWorks, Hortonworks, HPE, IBM, Informatica, Krux, Lotame, MapR, MarkLogic, MemSQL, Microsoft, Oracle, Pivotal, RedPoint, Redshift (Amazon), RiverSand, SAP, SAS, Snowflake, Stibo Systems, Talend, Teradata, and Zaloni. In addition to the 2016 Data Management Buyer’s Guide, industry news, Big Data and Data Analytics best practices, industry events, presentation and demo videos, Solutions Review is also host to the new Big Data & Analytics Week in Review videos series. The new series aims to recap the most important and impactful news, updates and best practices happening each week within the Big Data and Data Management space. These quick and easy to digest video recaps can be accessed through the website itself as well as Solution Review’s YouTube channel, providing visitors with another resource to help them stay abreast of all things Big Data, analytics, and Data Management during purchase, implementation, and maintenance periods. "Data Management solutions meet at the intersection of Big Data and business analytics. These tools allow for the ongoing care of vital data so that it may be readily and continually available for analysis; the process by which insights are discovered,” said King. “Thus, Data Management platforms may be seen as mediators between all of the data an organization collects for future use and a grand organizer that makes tidy analysis possible." With the release of Solutions Review for Data Management and Data Warehousing, Solutions Review continues to work towards being the best resource for IT professionals looking to address needs impacting Master Data Management, Data Analytics, Data Governance, Data Warehousing and larger Big Data initiatives. The Solutions Review for Data Management and Data Warehousing website contains all of the latest news and solutions updates, best practices, solution videos and presentations, industry events, and information that buyers of information technology solutions will need to make informative purchasing decisions for their Data Management needs.